Keep Your Finger on the Pulse in the Music Industry. With the onset of social media, the creative sector of our population has now more than ever the ability to share their work to people around the world. Be that photography, an album release or the latest remix, the amount of content out there is astounding. For the taste makers out there, keeping your finger on the pulse can be overwhelming to say the least. Whether you are a music blogger or an A&R scout looking for the next ‘underground’ hip hop star, you need to have a social media strategy to keep up with this fast paced industry. With the increase of music streaming platforms like Spotify, Rdio, Grooveshark, Songza, Soundcloud, and Bandcamp finding breakout music has become more accessible but also overwhelming, and often people don’t know where to start. 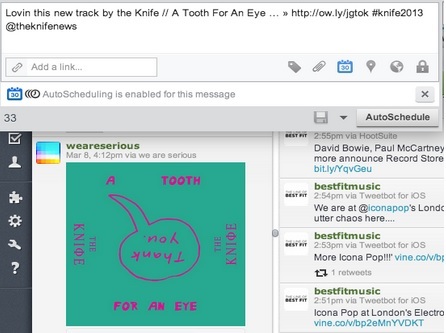 The following is the first of two blog posts outlining best practices for using HootSuite for music. Use HootSuite to successfully filter out the noise and save you time, so you can focus on finding music focus that matters to you. 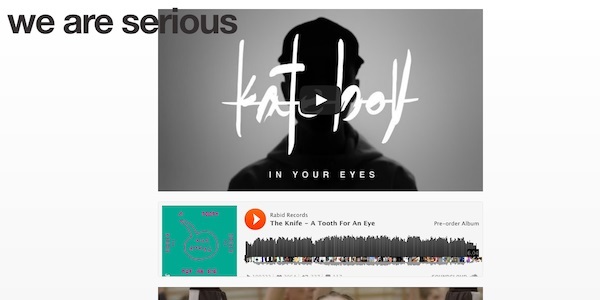 I run a music blog called We Are Serious and am often asked where I find the time to search for new music. My answer is always the same – I use HootSuite. Full disclosure: I work for HootSuite, and I’ve been lucky enough to learn the in’s and out’s of the HootSuite dashboard for the past 2.5 years. Regardless, I wouldn’t change the way I manage my social media. Without HootSuite, precious time would be wasted everyday having to manually sift through hundreds of blogs, Facebook pages and band websites for daily updates. 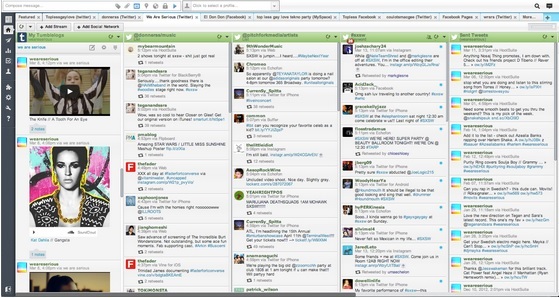 With HootSuite, I can easily customize my dashboard through streams, Twitter lists and app integrations that I monitor. HootSuite’s analytics help me gain insight into the demographics of my audience and what kind of posts earn the most engagement. This is a snapshot of how I have optimized my dashboard. It includes a Tumblr stream, Twitter lists and search streams, as well as a mentions and retweets stream all in one tab. Easy to see – easy to manage. Twitter lists and search streams are integral to my music hunt. Whether you’re sourcing out the latest releases from established artists, or finding new bands to follow, Twitter lists are your best friend. Because these lists are a curated group of Twitter users, you can organize your lists into different categories or groups. This allows for easy monitoring of tweets from a specific group you’ve created, without having to scan entire feeds. Tip: Create a list of emerging artists, as well as music blogs to follow. Subscribe to Twitter lists from larger music blogs like Pitchfork and create hashtag search streams during music festivals like South by South West, Bonnaroo or Roskilde. This way you stay connected with what’s going on even if you can’t be there yourself. 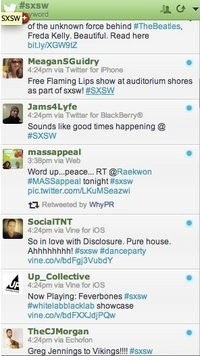 This is a hashtag search stream for #sxsw. By monitoring this feed, You can see what artists are trending. In order to minimize the chaotic nature of trying to follow too many Twitter handles, or bands’ pages, be strict with your “following” practices and choose wisely. Tip: Because social media has made it easier for musicians to release albums without big marketing budgets, many take advantage of a new distribution model where channels like Soundcloud streams, and Bandcamp are the norm. By simply following their Twitter handles, you can easily discover music straight from the source. If your music site is built using a blogging platform like Tumblr or WordPress, you can integrate these right into your dashboard through HootSuite’s App Directory. From here, you can update your blog from within HootSuite, and use HootSuite to share and amplify your post across different social networks. Tip: Install the Tumblr app, and then add a Tumblr stream to your dashboard. 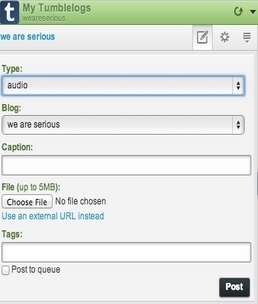 From this Tumblelog stream you can post audio, video or text messages straight to your blog. Once your blog has been updated, you can click on the small arrow in the top right hand corner of the post and HootSuite will populate a message that you can customize and send out through various social networks. Tip: Be sure to include hashtags and @mention the musician you are posting about. This in turn increases engagement and includes the band in the conversation so they can keep track of their social media traction. Though these are best practices specifically for finding new and relevant music, these tips can be applied to any other industry. Whether you are an avant-garde photography journalist, design zeitgeist or just trying to get your brand back on point, these best practices can help you save time and keep you ahead of the pack.